Sun Room Contractor in Maryland, Virginia, and D.C.
Sun Rooms in Virginia, Maryland, and Washington, D.C.
Is a sun room right for your home? Sun rooms are home additions that offer a healthy middle ground between screened porches and closed, full room additions. They are characterized by an abundance of large, screened windows that allow sunlight and fresh air to enter a home in the same way screen rooms do. However, their solid walls and insulative properties render them versatile, year-round areas that can be used like any other traditional room. Sun rooms are ideal for homeowners looking to invest in a flexible outdoor living space with utility. They allow the best of nature into your house - summer breezes, natural sunlight - while keeping out mosquitoes, stink bugs, and harsh Virginia winters. You could think of a "Florida Room" as a membrane for your house! 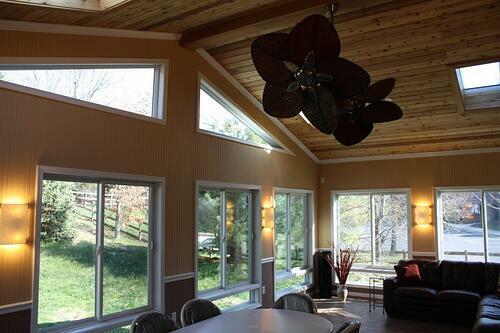 Visit our additions portfolio to see examples of our sun room builds. Is the sun room expanding an existing room or is it a seperate space with a door? Is there going to be a door to access your new sun room, or are you planning on opening up a wall to make an existing room much larger? This is the most important consideration; this will affect how to condition the room, how to furnish the room, and how the new space affects the rest of the house. If you are opening a wall to connect to an existing room you have to think about matching the flooring, wall colors, and trim. If you have a standalone sun room area that is separate from the existing house, you have more choices and create a uniquely styled room. Conditioning the room is a very important factor. There are a variety of ways to go about doing this. If the room is a quarantined stand along area, a mini split system is the best way to go. A mini split is a separate system that is made to condition one room alone. They are energy efficient so you won’t spend a lot on bills throughout the year. Manufacturers such as Mitsubishi and Daikin are some of the best models on the market. If you use the unit continuously you can expect a 500-700 cost per year, however the beauty of these machines, is that you only have to use it when you are in the room. It doesn’t take long to feel their effects. Flooring is another important consideration. Depending on whether you connect to an existing room or not, you will have a few choices. You can install tile flooring to keep the area cool on those warm summer days. Another alternative is a hardwood flooring system – both floating and traditionally installed flooring systems will work. The final option is to put down carpeting – this will help the room feel warmer and cozier. When building a structure with a roof, you are going to affect the natural sunlight that enters your home. Adding the sun room will keep natural light out of the existing space without proper planning. Sky lights help replenish natural light lost by roof construction. So be sure to add skylights in strategic locations to keep natural light inside the house. Also, the location and size of windows in the room will help maintain as much natural light as possible. A sun room typically has more window space than finished wall space, this is great for natural light during the day, but in the evenings you will need light to enjoy the room to its fullest potential. A ceiling fan with light is a good start. Recessed lights are a wonderful option, especially if they are on a dimmer to add a relaxed ambiance. Just make sure the recessed lights are located beneath the ceiling fan to avoid the strobe effect. Wall sconces placed in strategic locations can add to the look and help create a warm feeling all around. We always recommend a lamp near a sitting area so you can enjoy a good book during the evening. When planning for a sun room, think abou t the furniture you plan to put in the room. Furniture takes up a lot of space, knowing what you are going to put in the room and where you are going to place it is very important. Know where the sun is going to enter the room at different hours of the day. Also keep in mind the walkways throughout the new space. If you are planning on having a door to access the outside, natural walkways will cut the room in half, thus making it difficult to certain pieces of furniture.